If you ask a panel of weather experts what the best outfit is for facing down a tornado, the unanimous response will be something along the lines of, “What, are you joking? The only good outfit for an impending tornado is for heaven’s sake, get to shelter immediately and don’t worry about what you happen to be wearing!” They’re probably right about that, although they could have worded things a little more politely. But things happen, and sometimes you’re going to wind up getting swept away from your Kansas home in a tornado and dropped down in a land of mystery and magic. Supposing you do happen to find yourself out in the wind, though, you might not need as much heavy gear as you’d suppose. After all, the most famous tornado traveler Kansas ever produced made her journey in just a modest gingham dress. That might not seem like the sturdiest option for traveling yellow brick roads, facing down flying monkeys, or matching wits with wicked witches, but on the plus side, your hosts will probably provide you with a free footwear upgrade. Prepare your little traveler for her own trip to the wonderful world over the rainbow with this polyester pinafore dress in pretty blue-and-white checked broadcloth. 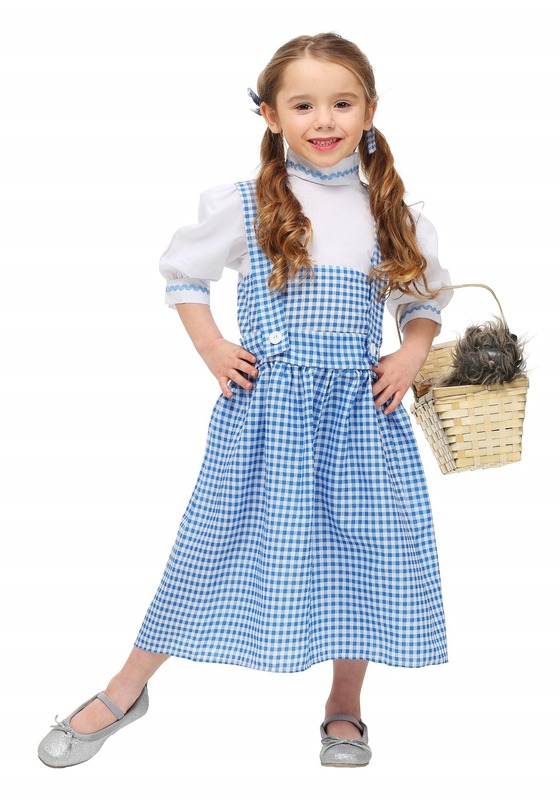 The dress features shoulder straps that fasten at the gathered waistline, with gingham trim on the collar and sleeve cuffs and a pair of gingham hair ribbons to match. The choice of shoes to go with it is up to you, but we might suggest something in the ruby family. Oh, and please don’t plan on walking into any tornadoes. Some things are best left to fantasy.